Arts and crafts for toddlers is an important part of your little ones life and future development. Toddlers need tactile and interactive activities such as painting, sticking or sand & water play, to help develop physical, cognitive and social skills. Those first few brush strokes and crayon scribbles are helping develop your child's fine motor skills, and their messy drawings and paintings will soon form recognisable shapes and letters, which will help your child, find learning to write, an easier and less daunting task. Isn't it amazing what Arts and Crafts for Toddlers can do! Hands on messy play such as painting, sticking or sand & water play, may seem like hard work to set up and then put away, but getting everything you'll need before you start, and by having your own toddler table and chair, you will save on the hassle of plastering your table with newspaper, and remove some of the anxiety over tips and spills. Spending time with your toddler doing arts and crafts for toddlers activities promotes creative play, language skills, social skills and helps you to find out what makes your child tick. By knowing what your toddler likes, you can both have more fun, and you'll see the benefits in their development. You will notice that your toddler, who could only sit for approximately 30 seconds at a table, will now sit until the activity is finished. And with their growing concentration and dedication to the task, they will enjoy the end result, and be pleased with what they have achieved. With your praise, the great masterpiece they have made will boost their self esteem, and make them eager to learn and do more. By playing with arts and crafts for toddlers tools such as glue spreaders, paint brushes, shape sponges and positioning materials to make a collage, you will help your toddler to develop strong muscle control and good hand-to-eye co-ordination. Unleash their creative and design skills. Learn to control equipment and develop fine motor skills. Explore a wide variety of materials and techniques. Develop social and emotional skills. Learn to share and make friends. Learn about cause and effect. Learn about colour, shapes, texture and patterns. Art games and equipment will help children to develop and grow their artistic ideas, developing their imagination and creativity. If you join in with these crafts for toddlers crafts games you will help your child to build self-assurance and confidence. And they will love your enthusiasm when you talk about both of your art ideas and plan what to do next. There are many things that you can do around the home to encourage these design and technology skills, so make it you mantra to Make it Yourself, it's a great educational kids game. Even simple ideas like making Christmas and Birthday cards for friends and relatives can be great fun, and to encourage their art skills and expression, let them try different materials and techniques such as painting and printing. Take a look at these kid's art games and craft activities that explore color, pattern and textures, as well as various making things ideas. Paints, Glitter Glue, Long Sleeve Art Apron, Spill Proof Paint Cups, Drawing Paper and Easels are just some of the Arts & Crafts Equipment that your child will need. These can be themed to suit a favorite character or color your child likes, or chosen purely on their quality and performance. 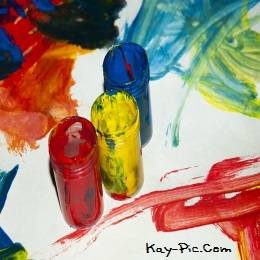 As your child uses their art games and equipment keep an eye on the techniques that your child uses. Do they cut along straight lines? Are they using the right amount of glue? Can they color within the lines? It can often be helpful for you to agree a project theme and aims with your child to help them to keep on task. For example, if you are making Christmas Cards, you could agree with your child that they will create 10 Cards for family and friends and for their efforts, you will do their favorite activity, such as cooking, painting or playing ball. Using a reward for task completion will help your child to see things through to completion, but be realistic, and choose a target based on what they can easily achieve, rather than on what you'd like them to achieve.